Remotely Piloted Aircraft (RPAs), commonly referred to as ‘drones’, have been the subject of much discussion surrounding potential operations in Syria, primarily in the context of enforcing a ‘no-fly’ zone or enforcement role similar to their role in Libya and modeled after operations in Afghanistan, Pakistan, and Yemen. This paper examines the prospects of the use of RPAs in Syria, finding RPAs as currently operated today counterproductive to potential political aims in Syria in an enforcement capacity. 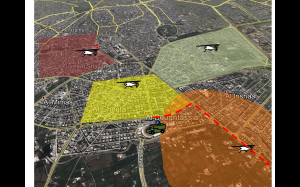 Smaller RPAs, operating in a number of other roles, could however play a critical role in overcoming the humanitarian conflict in Syria, from monitoring key sites designated by the International Community and allowed by the Syrian Government and opposition forces, to providing humanitarian aid, to overwatch of convoy movements to include the removal of chemical weapons. The stigma of RPAs, given their use in other conflicts, must be overcome to allow them to be evaluated and used as a tool for monitoring and aid among other roles, not just as offensive weapons of war. Today, as problems with enforcement of the chemical weapons agreement have bogged down and as the Obama Administration has signaled that the al Nusra Front appears increasingly to be a direct threat to the U.S. (Rohde, 2014), speculation is rising once more that a military option may be back on the table for Syria. While any military option would be fraught with a number of obstacles to planning, execution, and justification, the semi-regular talk of RPAs as a key instrument in many of these options is especially problematic. This stems in part from a limited popular understanding of the roles and capabilities of RPAs, and also a lack of imagination by policymakers for other ways in which RPAs could be a positive good, both for warzones like Syria and for other humanitarian crises globally. A move away from the mythology of the ‘drone’ and toward an appreciation for the spectrum of potential roles unique to RPAs over manned aircraft is vital to understanding how the ‘drone’ will likely play a far greater role as an instrument in peacetime. Conflation of the capabilities of strategic RPAs and the proliferation of tactical RPAs clouds RPA discussion. Just as strategic bombers such as the B-2 represent only one class of aircraft, Predator and Reaper represent only one limited application of RPAs. Understanding the array of RPAs and differentiating capabilities and limitations of systems is necessary to overcome the stigma of the RPA as a tool of war or assassination, and appreciating its potential uses in humanitarian crises. 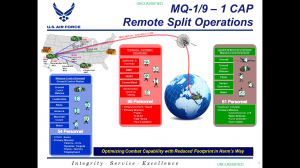 I divide RPAs as platforms between tactical and strategic RPAs based on their connectivity to their operator, which differentiates those that are reliant on global communications and intelligence infrastructure and are capable of long range, extended duration operations, and those that are more simple locally controlled line-of-sight RPAs. The strategic requirements and organizational capacity of states and organizations dictate which types of RPAs they will pursue, while the rate and nature of diffusion can be predicted by applying Michael Horowitz’s Adoption-Capacity Theory (Horowitz, 2011). This theory projects the rate of diffusion of a military innovation by evaluating its costs to implement versus its organizational capacity to adopt the change. Costs are a factor of the dual-use civilian-military applications of the innovation and the per-unit cost of the asset. Organizational capacity, meanwhile, is a function of the organization’s age, willingness to experiment, and critical task focus. The division of RPAs into two categories as previously defined allows us to evaluate both the diffusion of RPA platforms, as well as the potential uses of those platforms given the array of potential users. Tactical RPAs are likely to rapidly diffuse and see the most independent innovation in terms of their potential usage due to their low cost and the potential for numerous applications beyond the military sphere. In the U.S., a strong community of RPA enthusiasts already exists that is experimenting with a variety of commercial, recreational, and government applications for smaller RPAs. Amazon.com received attention earlier this year for their 30-minute RPA delivery plan, but other initiatives are at work to allow citizens to use RPAs to monitor crops, take overhead images for commercial purposes, and to assist in search and rescue for as low as $740 for a single system (Kelly, 2014). Such small RPAs already play a role in assisting in Search and Rescue missions providing both search and improved communications capability in isolated or hazardous environments (such as fires), and for delivery of small cargo such as heart defibrillators and medicine among other positive uses for such RPAs (Newman, 2013). Strategic RPAs require higher costs both to procure and to operate, which applies both to the unit and to the larger global intelligence and communications system involved in operating the asset. This results in higher operational costs relative to those of similar piloted airframes if a manned alternative exists. In examining relative costs, Table 1 shows the problem with conflating the costs of RPAs purchased online with the capabilities of strategic RPAs. The Global Hawk and U-2 represent the closest to a direct comparison of capabilities, while Table 1 shows the flight-hour cost are roughly comparable. Given the reachback and precision engagement requirements, the military-only applications of these airframes, and the resulting high per-unit costs these RPAs will be very slow to diffuse and innovation within the class of RPAs will likely be slow and incremental. Due to their high costs and the significant infrastructure requirements required to build and operate strategic RPAs, innovation occurs with these RPAs slowly and deliberately, with new innovations regularly referred to as ‘using only proven technology.’ This trend can be seen within the U.S. RPA force. 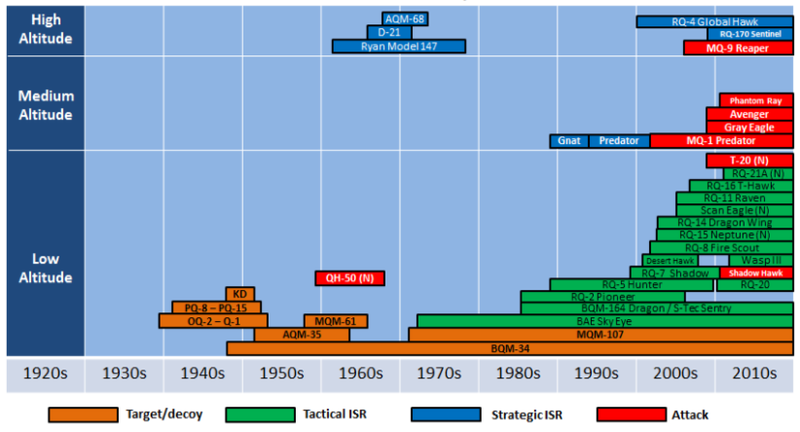 Figure 2 shows the growth of U.S. RPAs, to include target drones, tactical, and strategic reconnaissance RPAs since the 1930s. Tactical RPAs have adopted across a wider variety of missions and from multiple platforms, as their lower cost and limited operational capacity requirements has enabled both private sector and tactical operations innovations to allow a number of platforms to supplement existing operations. Strategic RPAs, on the other hand, have slowly evolved from wither the Predator or Reaper families, with the RQ-170 representing likely the baseline of future RPAs merged with the advancing Predator family under the Avenger. Given this classification of RPAs we are better positioned to evaluate the prospects for RPAs in both peacetime environments and in humanitarian crisis situations. Traditionally, RPAs in general are categorized as being ideally suited for missions that are ‘dull, dirty, or dangerous.’ However, given the high cost of strategic RPAs, low cost of tactical RPAs, and the capabilities and vulnerability associated with each class of RPA, strategic RPAs are best suited for those missions which can be categorized as ‘dull,’ with tactical RPAs better suited for those which are ‘dirty’ or ‘dangerous.’ ‘Dull’ missions require the lack of a threat and are enhanced by the persistent nature associated with the dwell time of strategic RPAs. The high cost of strategic RPAs precludes them in many cases from being used in dangerous environments unless deemed absolutely necessary given the risk of loss. Tactical RPAs, however, are relatively expendable given their low per-unit cost, while in many cases the shorter dwell times associated with these aircraft as well as the shorter range limited by line-of-sight control makes them less optimal for ‘dull’ missions. They can, however, be fielded by a wide range of actors who are free to innovate a wider variety of uses for the airframes. The RPA appears advantageous as it is seen by some as less of a violation of sovereignty than manned aircraft or a ground force. This is likely due to perceptions of U.S. operations where the U.S. has been accused of violating sovereignty with no recourse or justification. The realities of RPAs are more complicated however, and the likelihood of tacit Pakistani approval of operations as outlined by David Ignatius in 2008 (Ignatius, 2008) and more recently by the International Crisis Group (Drones: Myths And Reality In Pakistan, 2013) undercuts the likelihood of sovereignty actually being violated and which should in turn serve as a warning to future operations. If Turkey were concerned that manned flights would constitute a violation of Syrian territory, there should be no reason to believe that Syria would be less justified based on a similar violation by an RPA. The low speeds, lack of defenses, and mission requirements of extended loiter over a fixed area as Predator and Reaper are generally employed would make them easy targets for a state with an active air defense system and the will to employ it. Syria maintains a significant, though likely ill-maintained Integrated Air Defense System (IADS) capable of engaging a variety of targets. The June 2012 shoot-down of a Turkish RF-4 which violated Syrian airspace briefly illustrates Syria’s general willingness to shoot down aircraft in defense of its territory (Times of Israel Staff, 2012). Slaughter attempted to reframe this by saying all forms of intervention must be purely defensive, “only to stop attacks by the Syrian military or to clear out government forces that dare to attack the no-kill zones (Slaughter, 2012).” However, it is hard to see how any military operation designed to limit the Syrian government’s sovereignty anywhere within Syrian territory would be viewed by Syria, Russia, China, or Iran as anything but an offensive move. RPAs, seeking to enforce a no-kill zone from inside Syrian airspace against the will of the Syrian government would find themselves highly vulnerable to Syria’s air defense network, necessitating a large-scale air campaign to destroy most of the Syrian Air Force before RPA operations could commence. 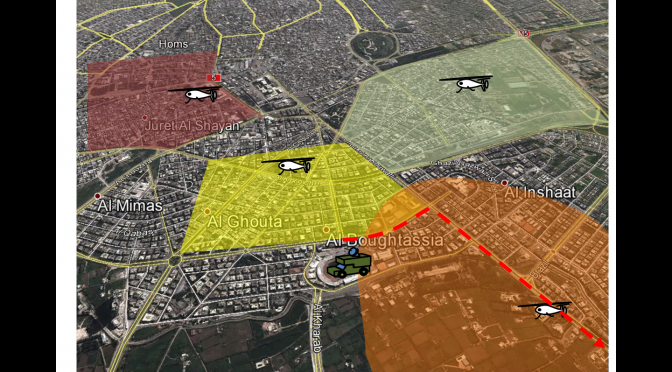 Due to the likely lack of UN approval for an operation, the threat posed by the Syrian IADS system and the necessity to secure airspace in advance of operations, and the implications of the loss of even a few strategic RPAs in Syria, RPAs as a tool for enforcement of either a no-fly or no-kill zone in Syria should be viewed as a non-starter. An incremental approach aimed at limited purely humanitarian aims should be the objective for planners interested in stopping the humanitarian crisis as modest interim agreements to limit fighting, protect civilians, and achieve other objectives such as eliminating chemical weapons appear to be feasible near-term objectives. In early 2014 a 72-hr truce was reached to evacuate civilians from the city of Homs, a limited ceasefire that was extended as peace talks faltered (Agence France-Presse, 2014). Similar evacuations have been thwarted by violence in the surrounding areas, while the removal of chemical weapons from storage depots in Syria were similarly delayed by such threats in addition to accusations of stalling on the part of the regime. In each of these cases, tactical RPAs similar to those used for search and rescue in the U.S. could have been used to supplement the operations in order to increase transparency of operations and assist in the delivery of vital humanitarian supplies of food, medicine, and other aid items to besieged communities and hard to access locations. Here, the aforementioned distinction between peace enforcing operations and peace keeping operations is critical, and in a sense the vulnerabilities of RPAs that were a vice for strategic RPAs can be a virtue for tactical RPAs. Unarmed RPAs could only be used with the consent of parties to the conflict and thus would need to be approved as part of a concept of operations with the approval for the intervention, be it removal of chemical weapons or humanitarian relief, and with it a reduced threat environment. The primary goal of a mission like convoy support would be to increase transparency both of the relief operation and the emergence of threats to the operation, which in part should serve as a deterrent to the emergence of threats. However, given the relatively low cost of tactical RPAs, were deterrence to fail resulting in RPAs being lost the economic cost would be relatively small while the likelihood that sensors aboard the RPA could identify the origin of the threat would in turn lead to greater clarity in assignment of blame for the attack and with it the potential to shape future negotiations to the violators detriment. The small size of tactical RPA payloads, limited range, and local control of operations would also allow for increased transparency to parties to the conflict for inspections of payloads to ensure no contraband is shipped in violation of agreements. For many of these operations, lessons can be learned from military applications of RPAs in conflicts like Iraq, but narrowly tailored to a neutral role. In 2006, the U.S. Army developed Task Force ODIN as a specialty team to detect and neutralize threats to convoys in Iraq. In its early years, this consisted primarily of coordinating ISR operations with convoys to secure route clearance, but over time evolved to a broader mission to identify and track insurgent networks to defeat cells before they could even emplace bombs (Glass, 2009). While the latter mission would involve direct intervention to proactively eliminate threats as part of a military campaign, lessons learned from early operations to clear routes and monitor activities in the areas of convoy movements could be tailored to meet the needs of international teams performing missions in Syria. For humanitarian relief, the lessons learned from search and rescue missions in the U.S. could provide a first step for developing concepts of operations to employ RPAs in those environments. 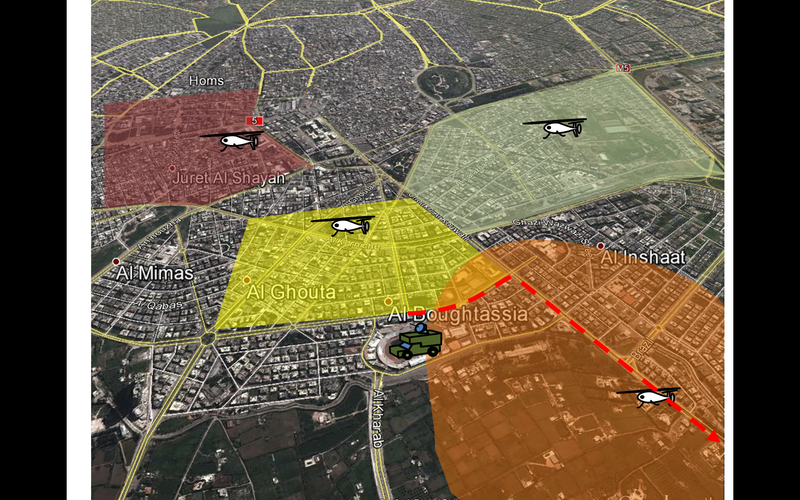 In the case of a future humanitarian operation to provide support for a besieged city like Homs, tactical RPAs could be used in the initial phases of the operation to provide overwatch in order to reduce violence. A ceasefire limited to an area such as a stadium would allow peacekeeping forces to set up a base of operations, to include an RPA ground station and launch/recovery zone, sufficient to enable several orbits of RPAs with both electro-optical and infrared sensors. These RPAs would allow for intelligence preparation of the operating environment to increase visibility of levels of destruction, identification of areas where people have taken shelter, and in addition could deter violence through increased visibility of ongoing operations. The RPAs themselves could be vulnerable to man portable surface-to-air missiles (MANPADs), but given the relative cost of the RPAs versus the information that could be gleamed from a shoot-down of an RPA by a MANPAD may justify the cost by both aiding to identify those who would violate a ceasefire agreement and by increasing visibility of the types of arms being brought into Syria and the levels of violence associated with the conflict. 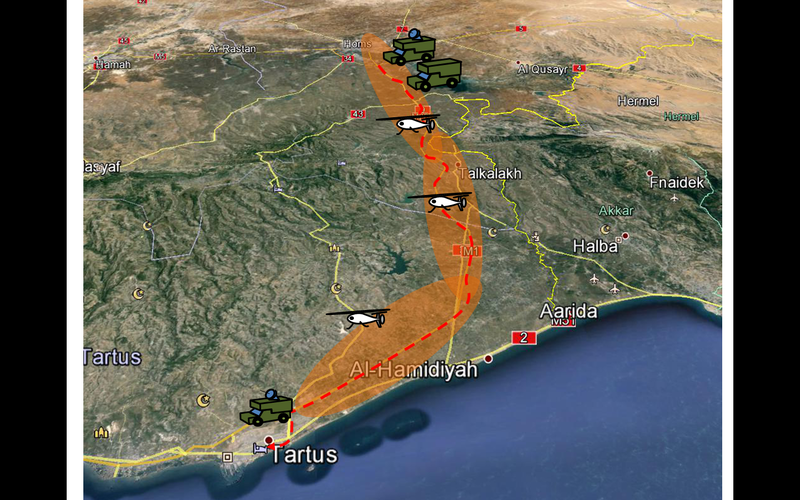 Figure 4 shows what a sample CONOP might look like, with multiple RPA orbits over selected areas of the city to be evacuated with additional orbits providing route pre-clearance for convoys of vehicles moving displaced persons to the port city of Tartus. Discussion of RPAs and the Syria conflict is heavily clouded by the images of Predator and Reaper as weapons of war, both by those who would like to see greater U.S. involvement in the conflict that may see them as a virtue, or by those who fear involvement and worry about escalation. The limited image of ‘drones’ has become a hindrance to their effective employment in humanitarian crises, a stigma which must be overcome to allow for their effective use in crisis situations. Smaller RPAs, flown by neutral operators, with the consent of parties to the conflict or impacted by the crisis, can play a major role in humanitarian relief, from search and rescue to increasing transparency. One major challenge to this point has been the stigma of ‘drones’ combined with the expertise residing largely in the military community or with military and government contractors. Many countries are uncomfortable with the U.S. flying ‘drones’ over their territory due to this stigma, even in crisis situations. Non-government organizations may similarly be unwilling to use RPAs for fear of being associated with military equipment which might negatively impact their mission. Understanding the nature and characteristics of the tool is vital to understanding their potential for both good and ill in humanitarian crises. Overall, given the stakes involved in the humanitarian crisis and the demands of the international community to ‘do something,’ the potential of unarmed tactical RPAs to be a force for peace in Syria in cooperation with limited international peacekeeping efforts appears to be a risk worth taking. Michael P. Kreuzer is a PhD Candidate in International Security Studies at the Woodrow Wilson School of Public and International Affairs and a Graduate Student Associate at the Liechtenstein Institute on Self-Determination at Princeton University. His forthcoming dissertation examines the military utility and likely patterns of diffusions for remotely piloted aircraft, and their impact on future international relations. He is an Air Force veteran of the wars in Iraq and Afghanistan, and holds a BS in History from the United States Air Force Academy, an MPA from the University of Alaska Anchorage, and an MSI from American Military University. Benjamin, M. (2013). Drone Warfare: Killing by Remote Control. New York: Verso. Horowitz, M. C. (2011). The Diffusion of Military Power. Princeton: Princeton University Press. Singer, P. W. (2009). Wired for War: The Robotics Revolution and Conflict in the 21st Century. New York: Penguin Press. (2005). 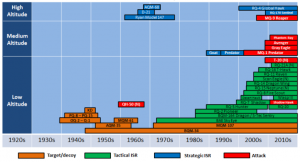 Unmanned Aircraft Systems Roadmap 2005–2030. Washington, DC: Office of the Secretary of Defense. This terminology is problematic for some airpower scholars as the airpower notion of ‘Effects Based Operations” defines all platforms as fundamentally tactical which in turn can have strategic effects based on the exploitation of the mission, but for my basic purposes it suffices as stressing that some RPAs will be limited to a narrow radius for operations in an environment where their operators are vulnerable (tactical RPAs) vice those that are the focus of air campaigns through a global operating system (strategic RPAs). The terminology here defines the character of the airframe vice the nature of the mission it performs. This claim is likely unrealistic and meant to garner headlines. Although Amazon is reportedly also working to patent a system that can predict customer orders in advance, for a small RPA which flies at under 100 mph Amazon would have pre-position warehouses with most of their inventory on hand roughly every 30 miles or at least within 30 miles of every major market in order to make such a system a reality even before processing and loading. At that point Amazon may as well allow in-person pickup which begins to look more like a catalog store. Figure derived from an unclassified Air Force slide provided to author by Lt Gen David Deptula (USAF, Ret). Even this comparison is imperfect as the U-2 has defense mechanisms, can fly faster, and carry a greater payload. Information from DailyTech report (Hatamoto, 2011). See Shalal-Esa (2013) for Global Hawk flight-hour costs. Likely noted first in Unmanned Aircraft Systems Roadmap 2005–2030 (Unmanned Aircraft Systems Roadmap 2005–2030, 2005), accessible online at http://www.fas.org/irp/program/collect/uav_roadmap2005.pdf. Singer and others readily use this phrase when describing the utilization of RPAs. Prominent examples include the report Living Under Drones (Living Under Drones: Death, Injury and Trauma to Civilians from US Drone Practices in Pakistan) and UN Investigator Ben Emmerson’s report from March 2013 (Abbot, 2013).